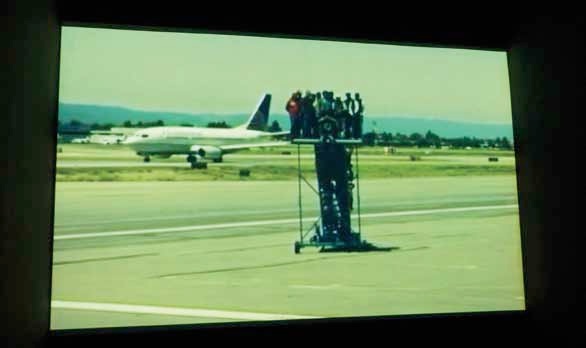 The opening shots of Centro di Permanenza Temporaneo show an empty boarding ramp on the tarmac of a sunny airport, framed in such a way that we cannot see the corresponding airplane. A group of about 30 men and women, seen from the top of the steps, then comes into the camera’s field of vision and walks up the steps. 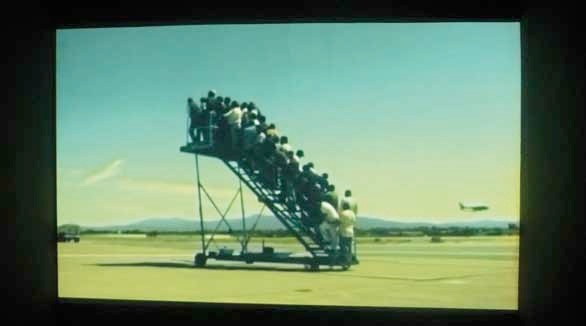 It is only once the people have gathered together, ready to embark, that we discover, from an overall shot, that the ramp is not serving any airplane. In their vain attempt to depart, these men and women remain blocked on the isolated boarding ramp, while aircraft taxi about in the background and remind us how easily “regular” passengers can travel. The title of Adrian Paci’s video is the name of a transit camp for illegal immigrants in Italy. Centro di Permanenza Temporaneo illustrates the absurdity of these people’s situation. Adrian Paci plays with a variety of scales, from sweeping shots, encompassing the boarding steps and the runway, to tight close-up shots which capture the people’s facial expressions and their slightest movements. 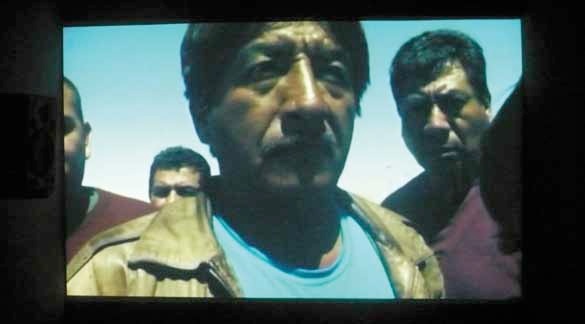 The artist underscores the special nature of each (hi)story, which he compares with the overall socio-political condition into which the undocumented immigrant is absorbed, and over which he, or she, has no hold. Despite the dead end in which such migrants find themselves, the violence of their situation and their isolation on these steps, Adrian Paci’s mise en scène illustrates the dignity of the people involved. Climbing a ramp only to realize, in the end of the day, that it does not lead anywhere, is a stereotype of the witty punch line. In Adrian Paci’s presentation, the narrative construction adopts the syntax of the gag, with a gradual rise of curiosity, and important information left off-screen, until the revelation of the final twist. But Adrian Paci breaks with custom. Instead of staying with the fleeting effectiveness of the final twist, he becomes insistent. He steps up the viewpoints over this boarding ramp which has no function. He goes through every manner of shot. Nobody falls, be it in an unreal or an elliptical way. There is no punch line, just an expectation—of things uncertain and indeterminate. Adrian Paci is interested in issues associated with the displacements of populations forced to migrate for economic and/or political reasons. By working with non-professional actors, but not in an outright documentary style, and by presenting people caught in the problems of exile, he does not hesitate to bring in his own (hi)story.